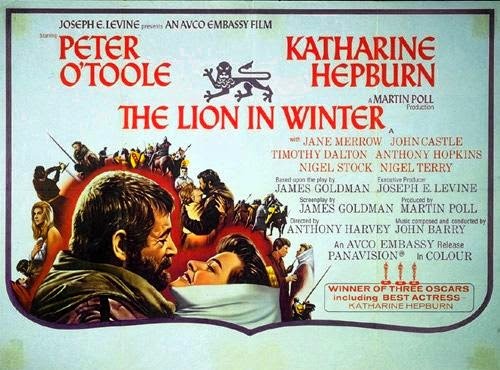 The Lion in Winter is a dark comedy about a dysfunctional family coming together for the holidays. There are a series of mishaps, comic interactions, and details laid out about the character's histories and relationships. The parents are separated but still have feelings for each other, the children have long since chosen sides, and someone's ex-boyfriend shows up and humiliates everyone. Without a doubt, it's firmly entrenched in the sub-genre of dysfunctional family Christmas dramedies. The first element that makes it infinitely more watchable than almost every one of its competitors is that it's set in 1183, and the family in question are the British royalty. The more important factors are that it's brilliantly written and features a cast of legendary actors. Katherine Hepburn, Peter O'Toole, Anthony Hopkins, Timothy Dalton... it doesn't get much more impressive than that. The script is adapted from a play of the same name which only predates the movie by a few years. Needless to say, it's an amazing script. The dialogue is fantastic, and the characters are intriguing. The story revolves around the line of succession and King Henry II's attempts to gain control of the Aquitaine from his estranged (and imprisoned) wife, Eleanor. They have three sons, Richard, John, and Geoffrey, all of whom want the crown. There's some historical basis to the situation, but the script takes even more liberties than you'd expect. The group meets up at Christmas, and Henry executes a plan to get Eleanor to give him the land he wants. It's a good plan overall, but he over-estimates John, under-estimates Geoffrey, and as a result it all falls apart. The story takes some dark turns, before ultimately resolving as happily as it reasonably can, given that history - and myth for that matter - clearly recorded that his sons never stopped fighting for the throne. There are more Christmas references than you might expect, including some intentional anachronisms. The holiday elements are kept front and center in both the script and screen, and it felt extremely appropriate thematically. This is, after all, about a king at the end of his reign looking to renew his empire. Alternatively, it's about a petulant man having a tantrum over the possibility he won't get the gift he wants for the holidays. The design and cinematography come off as somewhat dated, but none of that makes a difference: this is driven by the actors and the script. It's a phenomenal movie. Highly recommended.